We hope you can join us Saturday, November 9 for Saturday sketch sessions by Allison Davis (top layout) and Debbie Sanders (bottom layout). • If you want to purchase the embellishment add-on (shown below), you can order it when you register. 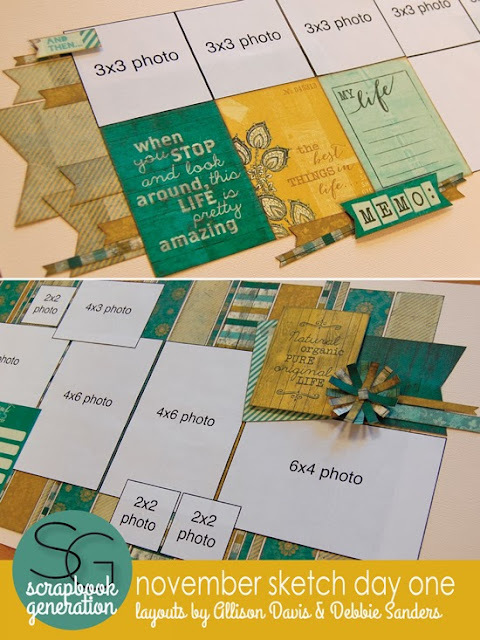 (This embellishment is not used on the layout samples shown above, but is offered for those of you who want to add another level of interest and creativity to your pages.) All embellishment add-on orders must be placed prior to the Saturday class. • The fee for a kit is $6, and is due at the time the request is made. • The best deal for our long-distance customers? Join the monthly Super Sketch Club and get the Super-Saver three layout kit, the Sketch Day One layout kit, and the Sketch Day Two layout kit (materials and sketches for five double-page layouts plus two bonus sketches -- a $24 value) for $20 plus $6.99 shipping. Our biggest classroom sale ever! Four days of after-Thanksgiving savings! Go grab your free download sketch for November! New kits, and a fantastic online sale!